A survey released by studentmoneysaver.co.uk has found, amongst other things, that 73.8% of students don't believe their maintenance loan is enough to live on and 41% of students have gone without food because of money concerns. The survey has found students are finding it increasingly difficult to afford university, with 28.7% of students saying they've considered dropping out because they can't afford to be there. 74% of students agree or strongly agree with the statement "I am worried about money"
60% disagree or strongly disagree with the statement "I feel financially secure"
Is your maintenance loan enough to live on? 74.8% of the students surveyed received a maintenance loan. Of those who received a loan, 73.8% believed it wasn't enough to live on. Have you ever considered dropping out of university because you cannot afford to be there? "I still haven't made my decision. I am on my placement at the moment and I think that staying on at the company to earn a real wage would be better than going back to uni. I don't know how I will cope. However I do know that having a degree is important and I don't want to waste the two years I have spent in uni so far." Have you ever gone without food because of money concerns? "There have been times when I have had little to eat within a week. Mainly because I was too embarrassed and didn't know where to go about it all. But when I found out that the university are able to help with that, they were able to help with food vouchers so I didn't go hungry." Have you ever had to sell possessions in order to make rent, pay bills or buy food? 33.3% of students have had to sell possessions in order to make rent, pay bills or buy food. The most common items were electronics, such as games consoles, laptops and tablets, as well as clothes. "The examples I gave above were just last month. I needed the money to pay for petrol and gas and electric. I managed to raise around £200 and just about scraped through the month. It's more difficult for me this year as I am on placement and spend around £250 a month on petrol commuting to my placement. In the past I have sold an iPad to raise money to pay for bills etc. I live with my boyfriend who is an apprentice so we both have low wages and often paying big bills like water and council tax (we still have to pay it as he earns over the threshold) is difficult." Other than selling possessions, have you ever had to do anything desperate to get money? 21.1% of students say they have done desperate things for money, other than selling possessions. Have you ever done anything illegal for money? Only 3.3% of students said they had done anything illegal for money, despite a lot of financial pressures. 7.7% of the students surveyed said that they have taken out a payday loan. This is much higher than the 2% found by the NUS last year. If you have taken out a payday loan, did you regret it? "We have taken out a number of Wonga and SmartPig loans. I regret it because I feel like I'm now in a vicious circle that I'll never be able to escape from. Most of my experiences have been ok, however there was one company that charged me £75 just for applying. It took me 2 weeks to reclaim the money so we really struggled that month. Since payday loan regulations have got tighter I can no longer get Wonga loans, this was a huge problem for us because we were trapped in this circle and couldn't lend any money to pay what we owed, that was when we had to decide to sell some things we own." 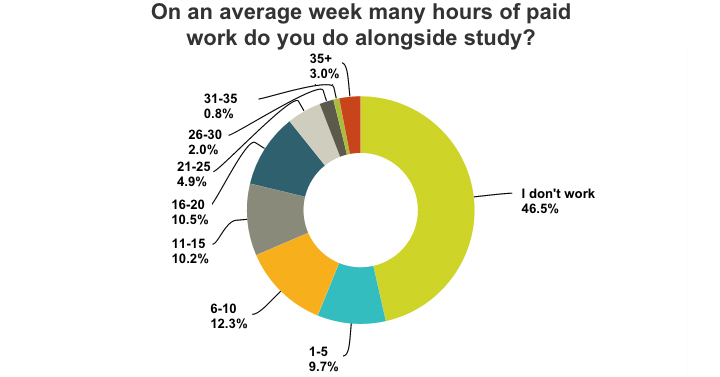 Students are increasingly working alongside their degree, although 46.5% of students say they don't work. "I am now in my second year, and i have been given less loan, even though my rent is more this year. Apparently we are expected to have job by the second year. I have applied for many jobs, but have had little success." Do you rely on money from parents whilst at university? "I have never told my parents because I worry they would be angry. They always told me to save money for uni and I never did." 74% of students agreed or strongly agreed that they were worried about money, with only 15.3% agreeing or strongly agreeing that they feel financially secure. In terms of their living situation 36.5% of students are living in cold student accommodation, and 29% say their accommodation has mold. When asked whether they could afford to put the heating on when it's cold, 28.9% of students said no, 63.6% of students said yes and 7.5% would prefer not to say. "Current students are facing bigger financial challenges than any other generation. They face massive rents whilst they're at university, and looming debt when they leave. It's clear that the current maintenance loan system is not working. Students receiving the full loan still think it is not enough to live on, and well over a 1/3 of students say they are going hungry because of money concerns. This is despite much more students having part-time jobs on top of their degrees than ever before. Living costs can be particularly difficult for students in living in London. The extra £2,269 you get for attending a university in the capital is quickly swallowed up by living and transport costs. £8,009 a year for London students is simply not enough. The government claims that students have not been put off by debts of up to £9,000 a year for their tuition fee loans. If this is the case, then students may not be put off by taking on more debt in order to have raise their maintenance loans so that they can afford to live on them. If this doesn't happen, more students will go hungry, more students will drop out and more students will risk the debt-spiral of taking out payday loans. Universities could do more to make sure students know what help is available to them. Of the students asked the question "have you ever applied for a hardship loan", 42.5% said "no, but this is because I have never heard of a hardship loan". When students are being targeted by payday lenders, universities need to be even more proactive to make sure students are receiving the right advice from the right people. - James Felton, Content Editor, Student Money Saver. "Hearing that students are poor, wouldn't surprise anyone. However, what this survey has shown us, is that the level of poverty is much worse than initially thought. Students are going without food and heating, as well as becoming desperate and selling possessions, taking out payday loans and seriously considering dropping out to get by. The fact that there are students living in serious poverty is completely unacceptable. Many parents have been completely left in the dark about this, and would be horrified to find how their children are living." - Charlotte Burns, Editor, Student Money Saver. "Yes I believe this is true that for most students who live away from home that the maintenance loan isn't enough to live on, this is mainly due to the high cost of rent when living in student accommodation, it may be different for those who choose to stay at home. I do receive the full maintenance loan, however most of this is taken away in order to cover rent and food costs and I am left with nothing, as in no spare money to spend on books or other items. The necklace I sold did have great sentimental value to me as my mum had owned it for many years and passed it on to me. I had to sell this at a jewellers who bought cash for gold, I raised around £180 yet the deposit of the flat was £250. I had to get the remaining amount from family members, who were willing to lend me the money on a short term basis. I felt that I had no choice as I had no other way to raise the money, and it did upset me that I had to sell the necklace. I also had a wardrobe clear out and sold various items on eBay and raised around £60 in total. This was to buy food as I had no money and felt again like I had no choice." You considered leaving university because of financial concerns. Have you decided to stay? What led you to your decision? "I have stayed on at university. I have done this as I have to consider my future, for me dropping out is not a choice as my family would be quite disappointed, and I would have no aspirations or aims for the future. I would still be left with a student loan to pay and this would all be for nothing. In order to do this I had to take out a £500 overdraft with the bank to cover food and bills such a my mobile contract. The £500 overdraft is now used to the maximum. I have often gone without food and will just have a bowl of cereal or toast as opposed to A proper meal. I do this quite often as I usually have limited food amounts. My mum knows about this and will often do a food shop for me sometimes so I have some food to take home. She will also lend me small amounts of money e.g. £20 when needed, which I lay back once I get my student loan, however she cannot do this all of the time as she is on a minimum wage and has bills etc to cover herself. I go home a lot of weekends so I can get a proper meal as my mum always makes sure I am well fed." "This research shows most students can't meet basic living costs from the standard maintenance package - and it is not at all surprising. Having been a student, and an officer for the last two years, I've seen how much the cost of living crisis is taking effect. Almost 30% have considered dropping out because of costs. In my first year, I had to do exactly that when I couldn't pay my rent. I've had students come to me who are using food banks, pay day loans; skipping classes because they can't fund childcare bills. When the primary concern of students should be about meeting their deadlines, many are having to make a choice between heating and food. Tuition fees are one thing, but the lack of financial support to fund living cots is shutting thousands out of education. If I'm elected as VP Welfare next year I will prioritise fighting for living grants and for students to have access to state benefits (like Carers' Allowance and Housing Benefit) where necessary. This year I've secured an extra £1million in funding for students at my university, helped to set up a cross-union campaign for funding for FE students and taken the Department for Work and Pensions to court over benefit sanctions (and won). We need co-ordinated action from the student movement on all of these fronts if we are to have an impact on the issues this research shows us are an urgent reality." Shelley's campaign page can be found here. You've said that your maintenance loan isn't enough to live on. Do you think this is true for most students? Do you receive the full loan? "I receive as much as possible for my loan, but my mum isn't financially able to support me, so its a struggle. I am now in my second year, and i have been given less loan, even though my rent is more this year. Apparently we are expected to have job by the second year. I have applied for many jobs, but have had little success." You've had to sell your tablet in order to raise money. Do you mind if I ask if that was for rent money, bill payments etc? Did you raise enough? "I had to sell my tablet when i was waiting for my loan to come through and it was a bit late, so I had no food. it was the only way I could survive." You've said that you've considered dropping out of uni because of financial concerns. Have you now decided to stay? What led you to this decision? "My university have been extremely helpful, especially when family matters were taking over things, making me unable to attend. They have given me food vouchers too to help me. Amazing." You've said that you've gone without food because of money concerns. Has this been a regular occurrence? Do your parents know about your troubles? Do you know who to turn to for help? You've said that your maintenance loan isn't enough to live on. Do you think this is true for most students? "I think it depends, I have some friends at uni who depend entirely on their parents. However, they are definitely the minority, they are the ones with extremely successful parents, rather than just those who earn slightly over the threshold and therefore get nothing. Saying that, I don't think it's fair to go off a parents wage because no matter how much they earn, it doesn't mean they will fund their child." Do you receive the full loan? "In my first year I didn't receive the full loan because my finances were difficult to calculate at the time. I am now entitled to and do receive the full loan." You've answered that you've had to sell a chest of drawers, jewellery, exercise machine etc in order to raise money. Do you mind if I ask if that was for rent money, bill payments etc? Did you raise enough? You've answered that you've taken out a payday loan and regretted it. Could you tell me which company this was, and why you regretted it? "We have taken out a number of wonga and smartpig loans. I regret it because I feel like I'm now in a vicious circle that I'll never be able to escape from." What was your experience of taking out a payday loan? "Most of my experiences have been ok, however there was one company that charged me £75 just for applying. It took me 2 weeks to reclaim the money so we really struggled that month. Since payday loan regulations have got tighter I can no longer get wonga loans, this was a huge problem for us because we were trapped in this circle and couldn't lend any money to pay what we owed, that was when we had to decide to sell some things we own." You've said that you've considered dropping out of uni because of financial concerns. Have you now decided to stay? You've said that you've gone without food because of money concerns. Has this been a regular occurrence? "This only happened last month and it was only for a couple of days because we sold some of our belongings." Do your parents know about your troubles? "No, I have never told my parents because I worry they would be angry. They always told me to save money for uni and I never did." Do you know who to turn to for help? "No, I read in the survey about a hardship loan which I will have a look into." This was a snapshot survey of 988 students. Raw data, images and quotes are available for use by journalists. For more information (or journalistic enquiries) please contact our content editor James Felton at james.felton@studentmoneysaver.co.uk, follow him on Twitter @JimMFelton.